Stripgenerator.com - the truth revealed! SHUTUP!! er ok. uhum. 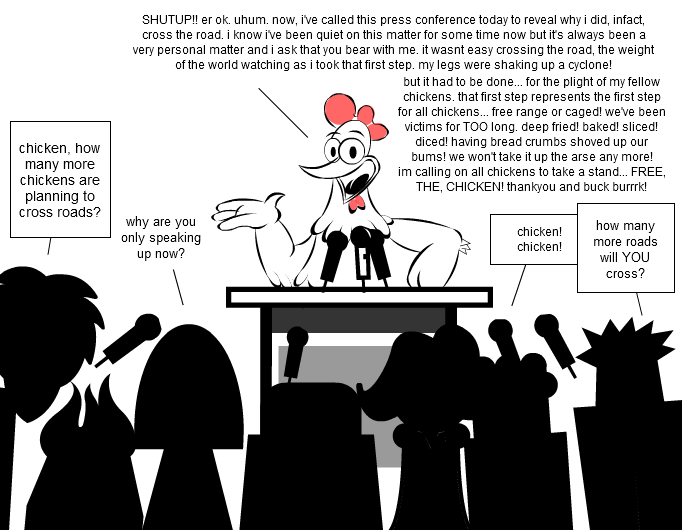 now, i've called this press conference today to reveal why i did, infact, cross the road. i know i've been quiet on this matter for some time now but it's always been a very personal matter and i ask that you bear with me. it wasnt easy crossing the road, the weight of the world watching as i took that first step. my legs were shaking up a cyclone! why are you only speaking up now? chicken, how many more chickens are planning to cross roads? how many more roads will YOU cross? but it had to be done... for the plight of my fellow chickens. that first step represents the first step for all chickens... free range or caged! we've been victims for TOO long. deep fried! baked! sliced! diced! having bread crumbs shoved up our bums! we won't take it up the arse any more! im calling on all chickens to take a stand... FREE, THE, CHICKEN! thankyou and buck burrrk! Why did the punk rocker cross the road? He had a chicken stapled to his face.